There is something about the smell of freshly-made bread wafting through the house which is so warm, comforting, and inviting! I have made fond memories of baking bread with my mom and siblings growing up. We didn’t have a Bosch, so Mom had all of us participate in the kneading instead. She’d divvy up the big mound of bread dough into five separate smaller mounds of dough and then she would set the timer for ten minutes and we’d all roll up our sleeves and get to work. Our efforts paid off when later the bread came out of the oven and we all got to slice off a piece while it was still warm and slather it with honey and butter. Delicious! With only two arms and two little ones right now, my bread-baking isn’t quite so ambitious. Instead of mixing it all up myself in the big silver bowl like my mom, I put all the ingredients in my bread machine. And instead of five loaves, I make one loaf. But, it’s still homemade bread and it’s still delicious. Best of all, it’s much better for you than store bought bread, it’s fresh, and it’s frugal! Here’s our current favorite recipe, adapted from Tammy’s Recipes. I usually make it at least two or three times per week. It’s so good, our little family can eat a whole loaf in a day! Put all ingredients in the bread machine in the order listed. Set on dough cycle. 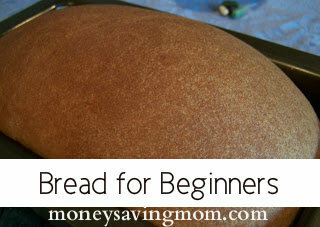 When dough cycle is finished, take dough out and shape into a loaf in a greased bread pan. Cover and let rise in a warm place for 20-45 minutes (until doubled). Bake at 350 degrees F. for 30 minutes or until golden brown. If you don’t have a bread machine, Tammy’s original recipe is here with directions for doing it by hand. Foods right now for $0.59/lb. That’s slightly more than I was paying for whole wheat flour at the store, but considering that it is organic and that freshly-milled flour is much fresher and higher in nutrition, it’s worth a bit of a higher cost to us. Crystal, Why don’t you do the whole cycle in your bread machine? Is there any reason you don’t let it rise and bake in there? I can’t wait to try out your recipe! Thanks! p.s. Love the new look!! I have never attempted to bake my own bread because I am afraid of the specific water temperature and the yeast. I’ll book mark this page and give it a try next week. I promise. If you have a Kitchen-Aid Large mixer (I know these are not frugal- but I got mine as a gift) you can easily let it do the mixing and kneading for you- when I make bread that it how I do it. I’m confused – if you have a bread machine, why not cook the bread in the bread machine? It doesn’t come out as a nice shaped loaf , or rise as well ,I like to take it out and reshape to a nice loaf or buns , and it gets a 2nd rising too ! Thank you so much for all you do. It has truely changed my life and my families lives. Do you have any recipes for bread making without any milk or soy. My daughter is very allergic to several things like milk, soy, nuts, fish, citrus. Thanks so much for you help and my God pour out His blessings on you! I have a Whisper Mill that I got over 10 years ago. I grind Red winter wheat. Your bread recipe is one of the best I have found!!!! We use your recipe almost daily and our whole family loves it!!! When I first got my grain mill, I couldn’t find a good whole wheat bread recipe for just 1 loaf…that’s when I found yours and we love it!!! Recently, I was able to buy a Bosch and now we use yours and increase the amounts to make 5 loaves!! Thanks for sharing!! why wouldn’t you just make the bread right in the bread machine? How funny! I just wrote about the Homemade Wheat bread recipe from Tammy’s on my blog yesterday! It was my first time making bread. I now count eating a slice of homemade bread still warm from the oven with a butter among my simple pleasures! This is one of our big money savers too. Of course our recipe is a little different. One of our main differences is we use honey instead of brown sugar. We also use all freshly milled wheat flour. The freshly milled flour is so good for you that we try to get as much of it as possible. We love homemade bread here…and that is all that we use. I do not buy any bread at the store, and have found that it saves us a ton of money. Not only is it frugal, I know exactly what I am feeding my family. Yes we use a kitchen aid for the kneeding. but its pathetic how simple it is to make bread. Eventually you get diff recipes you like more then the next but i cant say i’ve made a loaf I hated or something yet they’ve all been good. People should not be intimidated by bread making. It is easy the hardest part is waiting for it to rise but while you wait you do other things. Its probably easier to bake bread then to bake a cake. My advice dont be intimidated it is cheaper it is healther and it is tastier and it is not hard believe me. I have been baking my own bread since before my husband and I were married 4 years ago, and grinding my own wheat since then as well. I found a kitchen mill from a lady who was selling them pampered chef style, and when she bought a whisper mill, I got her display kitchen mill for$75. I use honey instead of brown sugar (it’s healthier, but pricier) and a kitchen aid to knead and prepare the dough. I bought a bread machine at a yard sale for $3, and thought I would use it, but it sits in the pile waiting for my own garage sale as it is much more satisfying to knead the bread with my own hands. It is, admittedly, much messier. I love the way my house smells on Thursdays. My recipe makes 2 loaves, and we only use one, so we pass the second loaf on to others. I love making homemade bread!!! I don’t use my bread machine to bake the bread because I don’t like the end result. The crust is much softer and the bread tastes much better–in my opinion–when baked in the oven. Love the new design and the recipe. I was just telling my friend the other day about how I needed a new bread recipe to try. Thanks for the tasty goodness. I’m sure you’ll hear about this at some point, but I can’t recommend “Artisan Breads in 5 Minutes A Day” highly enough. It’s a no-knead recipe, and the idea is that you spend 10 min. on the dough one day and only 5 min. of hands-on time every day or two actually shaping and baking bread. It’s a great investment. I do have a couple of questions, though… I belong to Sam’s Club, so I can get two Orowheat loaves for $4, which really is not bad at all. When you figure in the oven use and the rising (no pun intended) price of flour that I’ve noticed lately, I’m wondering if it’s really that big a money saver. I enjoy the fresh baked bread, so I do it for taste and enjoyment, regardless. Looks like a great recipe! I can’t wait to try it. I love homemade bread. I prefer to bake mine in the oven as well rather then in the bread machine. It makes a much prettier loaf. Thanks for the recipe! What type of bread machine do you use for the mixing/kneading? Thanks Crystal! I was looking for a good recipe! I will try it for sure!! I grind my own flour too! ( Using my mom’s mill! :o)) Only, I have a great source for the wheat berries and it’s cheaper than buying flour in the store! … an Amish community! And they sell it cheap there! Along with yeast!! I have to say this is the BEST whole wheat bread recipe I have every made.. and I have made a LOT in search of my “perfect one” and this is it!!! Thanks so much for posting this!! This bread really is the best! to those of you that are making multiple loaves of bread, what is your best method for storing it in the freezer? how long will it last there? i made this recipe today and was HANDS DOWN the best i’ve ever made! the entire family loved it! we were having phone issues today and the man from the phone co had to come by…he walked in just as i was taking the pan out of the oven! he said it was like heaven! I love that grainmill! I have one about 30 years old that my mother-in-law never used and gave to me 6 years ago or so. (they have changed it a little) It is so sturdy and does every grain I have ever given it with great gusto! We buy our grain from a grain mill that sells to farmers. It is food grade and we get it much cheaper. In March we bought it for $27 a 60lb bag of grain. Corn and Rye were much cheaper so we supplement that in with our wheat. I made this recipe last night, and my family loved it. The only problem is that we barely managed to slice 12 slices so we could each have two! I totally agree with baking the bread in the oven. The crust is definitely softer. Thanks for a great recipe which my family has already requested I make again. A sweet friend shared this tip with me on freezing bread. Put your cooled loaf into a plastic bag and twist-tie it. Put it in a brown paper sack and fold the top of the bag down. Never any freezer burn or bad taste! I bake either six whole wheat sourdoughs or five honey whole wheats at a time, and pop them into the freezer this way. I try not to leave bread in the freezer more than 6-8 weeks. The fresher the better! Okay, I’ve tried your bread recipe about 3 times now. The first time was completely in the bread machine. The other times, I did the dough in the machine and then baked it in the oven. I found the bread very tasty and a good texture. It was lovely for sandwiches. However… It didn’t rise much higher than the pan. Any advice? I know this is an older recipe but I love it! My one question is what size bread pan do you use? 9×5 or 8×4? The link to Tammy’s original recipe is not working. Can you send the recipe or post a new link. Unfortunately, her site is no longer in existence.